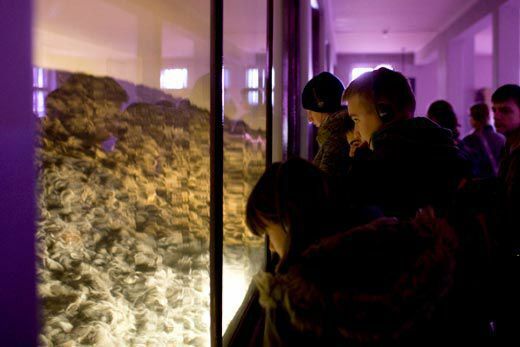 Everyone who visits Auschwitz remembers the hair: almost two tons of it, piled behind glass in mounds taller than a person. When I first visited the camp, in 1991, the hair was still black and brown, red and blond, gray and white—emotionally overwhelming evidence of the lives extinguished there. As the Schutzstaffel grew in numbers, their leader, Heinrich Himmler, needed a base. He chose the remote and mysterious Wewelsburg Castle as their Nazi fortress. 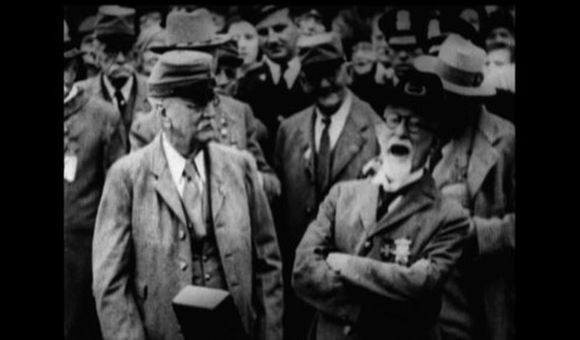 Video: Where is the Nazi Temple of Doom? When I returned this past autumn, the hair was a barely differentiated mass of gray, more like wool than human locks. Only the occasional braid signaled the remnants of something unprecedented and awful—the site where the Third Reich perpetrated the largest mass murder in human history. At least 1.1 million people were killed here, most within hours of their arrival. 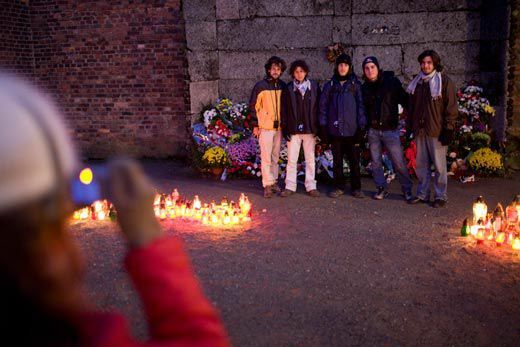 This January 27 marks the 65th anniversary of Auschwitz’s liberation by Soviet soldiers. The Nazis operated the camp between May 1940 and January 1945—and since 1947, the Polish government has maintained Auschwitz, which lies about 40 miles west of Krakow, as a museum and memorial. It is a Unesco World Heritage site, a distinction usually reserved for places of culture and beauty. Banas introduces me to conservators working to preserve evidence of camp life: fragments of a mural depicting an idealized German family that once decorated the SS canteen, floor tiles from a prisoners barrack. In one room, a team wielding erasers, brushes and purified water clean and scan 39,000 yellowing medical records written on everything from card stock to toilet paper. 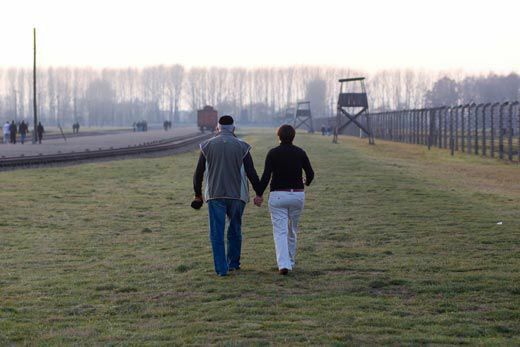 The Auschwitz camp itself covers 50 acres and comprises 46 historical buildings, including two-story red brick barracks, a kitchen, a crematorium and several brick and concrete administration buildings. 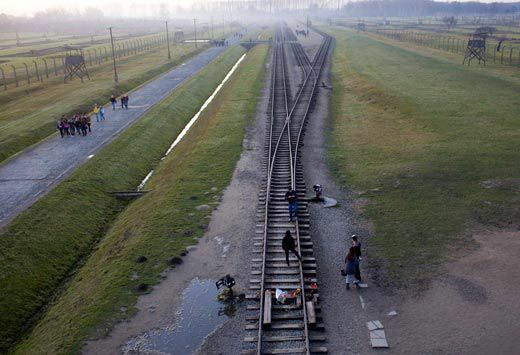 In addition, Birkenau, a satellite camp about two miles away, sprawls over more than 400 acres and has 30 low-slung brick barracks and 20 wooden structures, railroad tracks and the remains of four gas chambers and crematoria. In total, Banas and her staff monitor 150 buildings and more than 300 ruins at the two sites. Banas says dozens of barracks have cracked walls and sinking foundations, many in such sad shape they’re closed for safety reasons. Water from leaking roofs has damaged wood bunks where prisoners once slept. At the same time, public interest in the camp has never been higher. 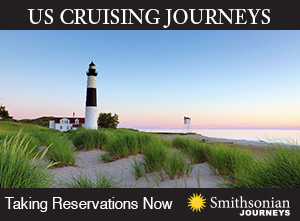 Visits have doubled this decade, from 492,500 in 2001 to more than 1 million in 2009. 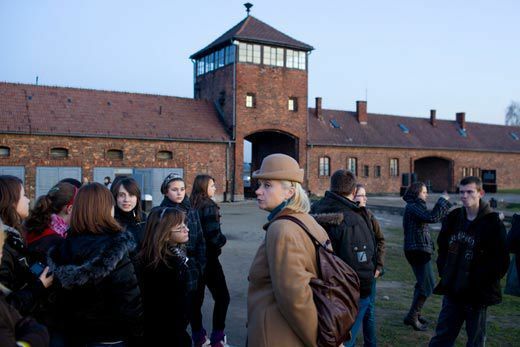 Since Poland joined the European Union in 2004, Krakow has become a popular destination for foreign tourists, and Auschwitz is a must stop on many itineraries. A visit is also part of education programs in Israel, Britain and other countries. On peak days, as many as 30,000 visitors file through the camp’s buildings. 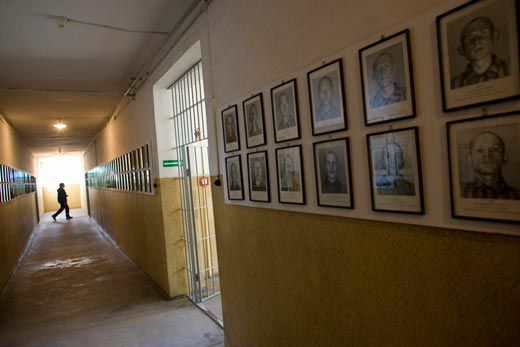 Until 1990, the museum’s directors were all former prisoners. Cywinski is just 37. His office is on the first floor of a former SS administration building directly across from a former gas chamber and crematorium. He tells me that Auschwitz is about to slip into history. 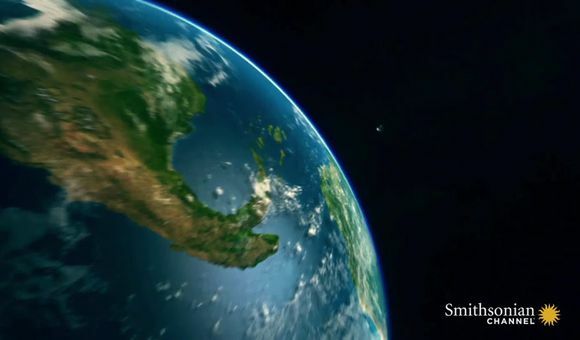 The last survivors will soon die, and with them the living links to what happened here. Preserving the site becomes increasingly important, Cywinski believes: younger generations raised on TV and movie special effects need to see and touch the real thing. Realistically, the Polish government and the proponents of preserving Auschwitz are not about to abandon the place, but at times during my visit I had some appreciation for van Pelt’s perspective. I arrived on the September day the camp counted its millionth visitor of the year. 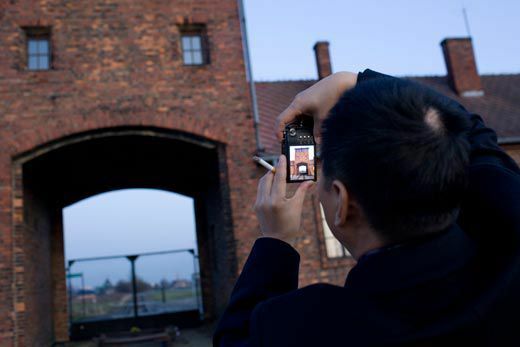 Cellphone-wielding visitors snapped pictures of the sign at the main gate, Arbeit Macht Frei (Work Will Set You Free). 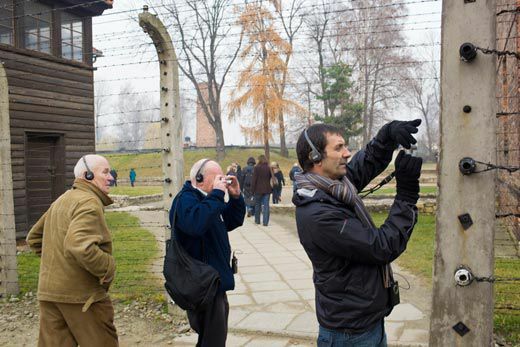 Tour group members wearing headphones stood shoulder to shoulder with their guides speaking into wireless microphones. 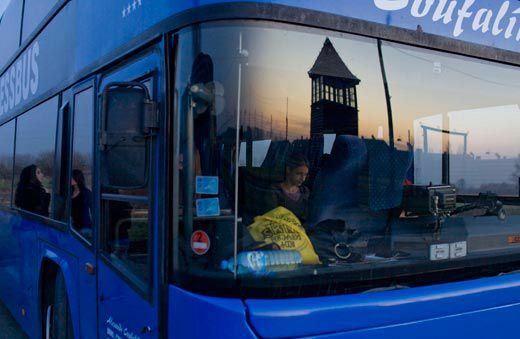 At the Birkenau camp, a five-minute shuttle-bus ride from the Auschwitz visitor center, the scene was so peaceful it was almost impossible to imagine the sea of stinking mud that survivors describe. The vast expanse was covered in neatly mowed grass. 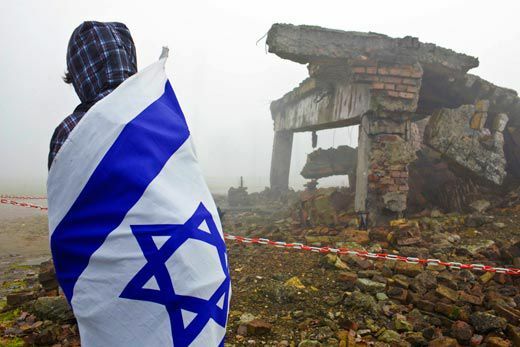 Flocks of Israeli teenagers in matching white-and-blue hoodies wandered from ruin to ruin. As I stood at the stairs leading down into the ruined gas chambers, a dozen Brits posed for a group picture on the steps of a memorial just a few yards away. Early one morning I met Stos, a retired architect, at his small first-floor apartment on the outskirts of Krakow. We sat in his small, dark dining room, a plate of jam-filled ginger cookies on the starched white tablecloth between us. He said he grew up in Tarnow, Poland, about 50 miles from Krakow. He remembers the day the Nazis shipped him off to Auschwitz: June 13, 1940. It had been almost a year since Germany invaded Poland and launched its campaign to destroy the nation. Following instructions issued by SS chief Reinhard Heydrich—“the leading strata of the population should be rendered harmless”—the SS killed some 20,000 Poles, mainly priests, politicians and academics, in September and October 1939. Stos was an 18-year-old Boy Scout and a member of a Catholic youth organization. Germans put him and 727 other Poles, mostly university and trade-school students, in first-class train cars and told them they were going to work on German farms. Prisoners were crammed into the crumbling barracks and provided only a few hundred calories a day. Most died of starvation, exhaustion and diseases such as typhus and dysentery. Beatings, torture and executions were commonplace. Camp doctors conducted experiments—usually fatal—on prisoners, looking for ways to sterilize women with radiation or toxic chemicals, and studying the effects of extreme cold or starvation on the human body. In the first few years of the camp, 80 percent of new inmates died within two months. After about an hour, I thanked him and stood up to leave. He handed me a white envelope. Inside was a slim memoir he published nearly 30 years ago. 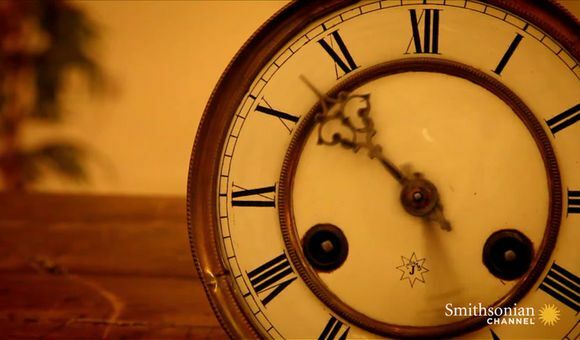 “My memory isn’t so good any more, you understand,” he said, shaking my hand and smiling. “But it’s all in there.” Later, I flipped to a page near the end. In October 1944, Stos was sent from Auschwitz to a series of camps deep in Germany. 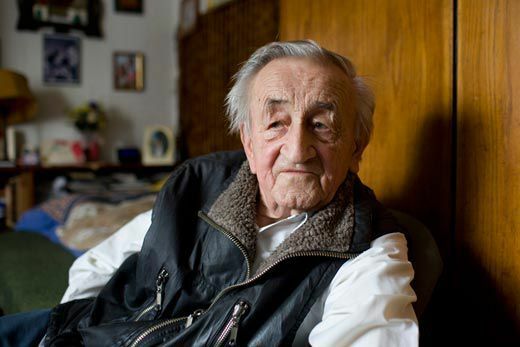 On May 8, 1945—the day the war in Europe ended—he was liberated by Russian soldiers. On the book’s second to last page is an undated black-and-white photo. It shows Stos with his children and grandchildren standing under the Arbeit Macht Frei sign. Auschwitz didn’t long remain a camp exclusively for Poles. In June 1941, Germany launched a surprise invasion of the Soviet Union, taking three million prisoners over the next seven months. Many were starved to death. Others were sent to occupied Poland or Germany as slave laborers. In the fall of 1941, ten thousand prisoners of war arrived at Auschwitz and began building the Birkenau camp. Most of the POWs died within weeks. “When it was time to get up in the morning, those who were alive moved, and around them would be two or three dead people,” one Russian survivor says in the 2005 book Auschwitz: A New History by Laurence Rees. “Death at night, death in the morning, death in the afternoon. There was death all the time.” The prisoners built the barracks at Birkenau in a rush, laying a single course of bricks on poorly made foundations. The flood of Soviet POWs overwhelmed the already crowded camp. Pressure to “eliminate” people—the Nazi euphemism—grew. In 1940, the Nazis used carbon monoxide gas in secret euthanasia programs at mental hospitals in Germany to eliminate mentally ill or disabled people. From there, it was but a small step to Zyklon B, a cyanide compound designed for delousing. 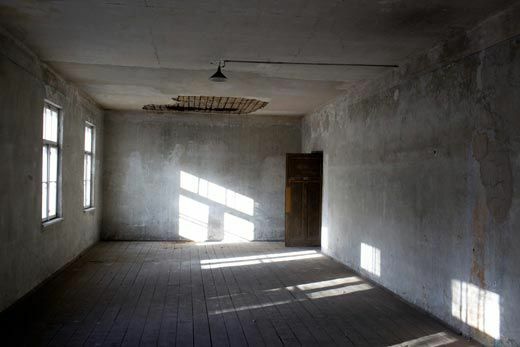 In September 1941, Auschwitz guards herded hundreds of Soviet POWs and sick inmates into the crudely sealed basement of Block 11, the dreaded punishment barrack; a guard threw in pellets of Zyklon B and shut the doors. They were the first people gassed at Auschwitz. Guards and other camp personnel refined the procedures in ways that minimized their guilt and maximized efficiency. They soon moved the gassings from Block 11 to the crematorium at the camp’s outer edge. The crematorium would survive the war mostly intact, and today is a central part of any visit to the camp. “Responsibility is extremely direct in face-to-face shootings,” Dwork says. “In gassing and cremation, each person is given only a small part.” Eventually, Germans took part only by tossing the cyanide pellets into the gas chambers. Everything else—herding prisoners into the chambers, ripping out gold fillings and loading corpses into the crematoria—was handled by groups of prisoners, known as Sonderkommandos. By 1942, Auschwitz had mushroomed into a massive money-making complex that included the original camp, Birkenau (officially labeled Auschwitz II) and 40 sub-camps (mostly located in and around the nearby town of Oswiecim but some as far away as Czechoslovakia) set up to provide slave labor for chemical plants, coal mines, shoe factories and other ventures. In their eagerness to carry out orders, advance their careers and line their own pockets, mid-level bureaucrats like Höss implemented what came to be known as the Holocaust. On January 20, 1942, fourteen such functionaries assembled at a lakeside villa outside Berlin to discuss a “Final Solution” to what was called “the Jewish problem.” What we now know as the Wannsee Conference put on paper plans that Hitler and his subordinates had been talking about for months. Of Europe’s 11 million Jews, those who could work would be worked to death, following the model already created at Auschwitz and other camps. Jews who were not selected for useful labor would be eliminated. The conference led to a dramatic increase in activity at the Nazi death camps. In a massive campaign code-named Operation Reinhard, Germans killed 1.5 million Jews at small camps deep in the forests of eastern Poland from March 1942 to October 1943. Treblinka and the now nearly forgotten camps Sobibor and Belzec consisted of little more than gas chambers and train tracks. There were virtually no survivors, no witnesses. 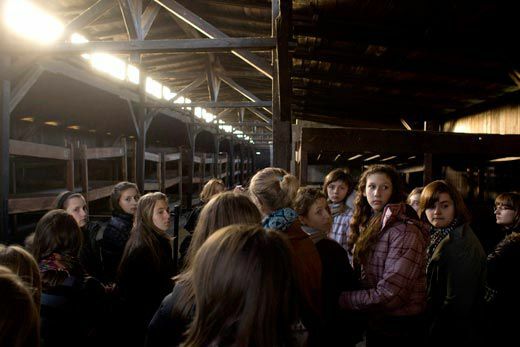 Auschwitz is enshrined in history in part because, as a work camp, there were survivors. 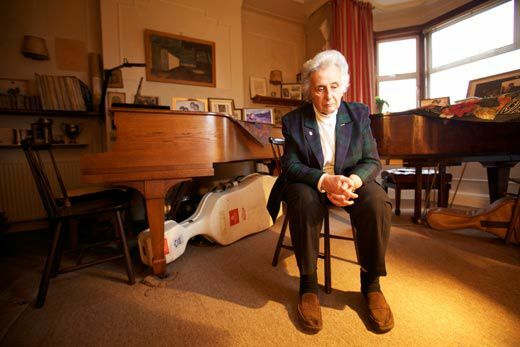 Anita Lasker-Wallfisch was a 14-year-old Jewish cello student living in the German city of Breslau (now Wroclaw in Poland) when the war broke out. Two years later, she and her sister Renate were sent to work in a nearby paper factory. In 1942, after the Germans deported her parents to a death camp, the sisters doctored their identity papers and tried to escape. They never made it beyond the Breslau train station. The Gestapo arrested them on the platform. The Lasker sisters were accused of forgery, aiding the enemy and attempted escape. After a perfunctory trial and months in a prison, they were sent to Auschwitz in separate transports as convicted felons in late 1943. By then, Auschwitz was serving as both a slave labor facility and a death camp. As the Germans brought more and more Jews from all over Europe to the sprawling complex, SS doctors selected the fittest for work. 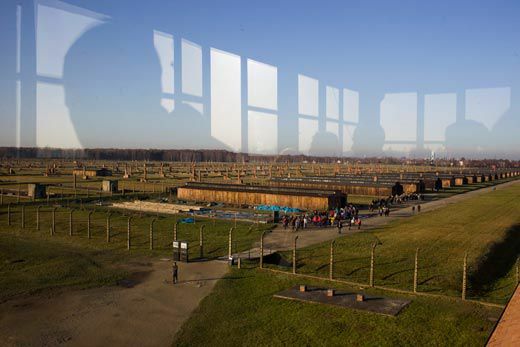 Other prisoners were sent directly to Birkenau’s gas chambers for what was euphemistically known as a special action. “Was present for first time at a special action at 3 a.m. By comparison Dante’s Inferno seems almost a comedy,” SS doctor Johann Paul Kremer wrote in his diary on September 2, 1942. Camp records show the transport he observed contained 957 Jews from France; only 12 men and 27 women were selected for work. When I met her at her house in London, Lasker-Wallfisch, 84, explained that she and her sister avoided the dreaded selection process because they went to Birkenau as convicts. “People shipped from prisons weren’t shipped in huge trainloads of Jews,” Lasker-Wallfisch said. “They were shipped as individuals, which was an advantage. It’s not worth turning the gas on for one Jew, I suppose.” Instead, Lasker-Wallfisch was stripped, guards shaved her head and an inmate tattooed her with an identification number (a practice unique to Auschwitz). Lighting a cigarette in her airy, light-filled London living room, she shows me the blurred, faded number high up on her left forearm: 69388. After less than a year at Auschwitz, Lasker-Wallfisch and Renate were among the tens of thousands of prisoners transported to camps in Germany. 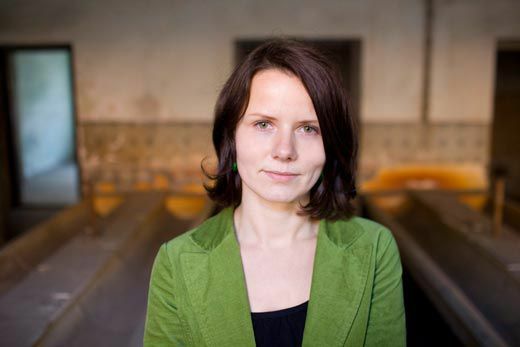 Lasker-Wallfisch had no idea where she was being sent, but it didn’t matter. 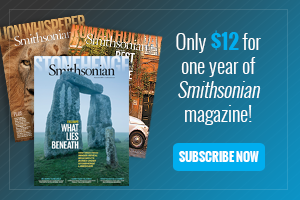 “The gas chambers were still working when we left,” she says. “I was very pleased to be rolling out of Auschwitz. We figured anything was better than the gas chamber.” On April 15, 1945, British troops liberated Lasker-Wallfisch and Renate from the Bergen-Belsen concentration camp near Hamburg. Lasker-Wallfisch emigrated to England after the war and became a professional cellist. Her sister Renate worked for the BBC, and is now living in France. 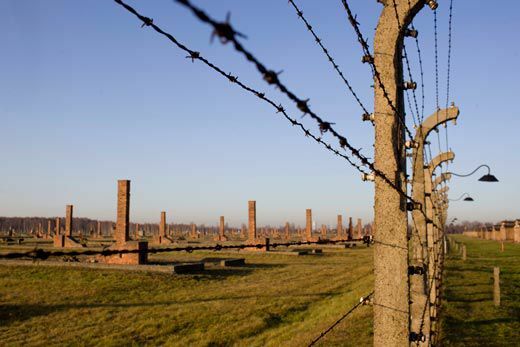 As Soviet troops closed in on Auschwitz in late January 1945, the SS hurriedly evacuated some 56,000 prisoners on death marches to the west, then blew up the Birkenau gas chambers and crematoria to erase evidence of the mass murders. The Red Army liberated Auschwitz on January 27, 1945. Some 6,000 people were still alive at Birkenau. Another 1,000 were found at the main camp. Ever since the Auschwitz memorial and museum first opened to the public, in 1947, workers have repaired and rebuilt the place. The barbed wire that rings the camps must be continuously replaced as it rusts. In the 1950s, construction crews repairing the crumbling gas chamber at the main Auschwitz camp removed one of the original walls. Most recently, the staff has had to deal with crime and vandalism. 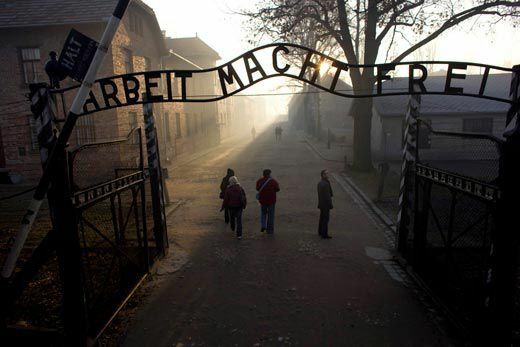 This past December, the Arbeit Macht Frei sign was stolen by thieves, who intended to sell it to a collector. Although the sign was recovered, it was cut into three pieces and will need to be repaired. He is not the only one to argue against wholesale preservation of the camp. A 1958 proposal called for paving a 230-foot-wide, 3,200-foot-long asphalt road diagonally across the main Auschwitz camp and letting the rest of the ruins crumble, forcing visitors to “confront oblivion” and realize they could not fully comprehend the atrocities committed there. The concept was unanimously accepted by the memorial design committee—and roundly rejected by survivors, who felt the plan lacked any expression of remembrance. 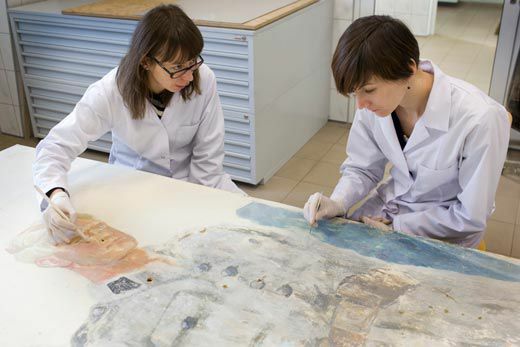 For the preservation staff, the burden of remembrance informs every aspect of their restoration efforts. “If there’s damage to an object as part of its history, we leave it that way,” Banas says. She points to crates of shoes stacked in a hallway, most with worn insoles and uneven heels—signs of human use that will be left as they are. The International Auschwitz Council—museum officials and survivors from around the world dedicated to the conservation of Auschwitz—has decided that the mounds of hair will be allowed to decay naturally because they are human remains. After three days at Auschwitz, I was left with the feeling that for some visitors, the former concentration camp is a box to check off on a tourist “to-do” list. But many people appeared genuinely moved. I saw Israeli teenagers crying and hugging each other and groups of people transfixed by the mug shots of prisoners that line the walls of one of the Auschwitz barracks. Walking through the room full of hair still makes my stomach churn. But what I hadn’t remembered from my first visit was the room next door filled with battered cooking pots and pans, brought by people who believed until the last moment that there was a future wherever they were being taken. 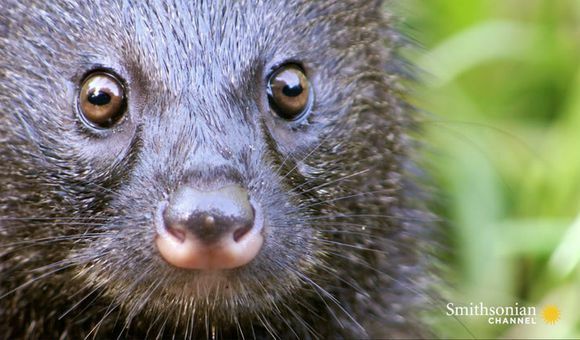 And when Banas told me about the carefully folded math test that conservationists found hidden in a child’s shoe, I choked up. Even if only a fraction of the people who come here each year are profoundly affected, a fraction of a million is still a lot of people. 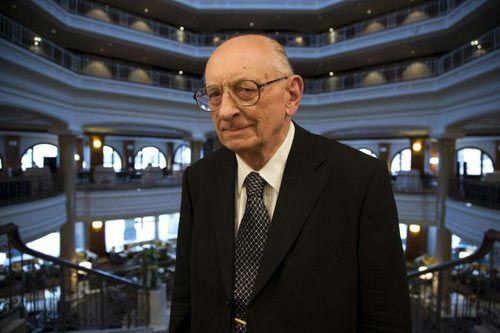 There is no more forceful advocate for the preservation of Auschwitz than Wladyslaw Bartoszewski. Born in Warsaw in 1922, Bartoszewski, 87, was a Red Cross stretcher-bearer when the German Army invaded the capital city in September 1939. Plucked off the street by German soldiers a year later, he was sent to Auschwitz. He’d been there seven months when the Red Cross arranged for his release in April 1941—one of the few inmates ever set free. After Auschwitz, he helped found an underground organization to help Poland’s Jews. He fought against the German Army during the Warsaw Uprising in 1944. 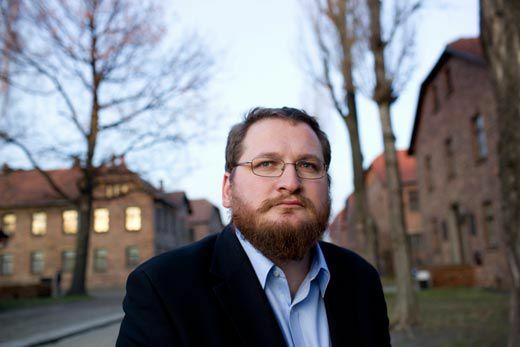 He was jailed three times: twice as an active dissident during Poland’s early communist era and once for his support of the Solidarity movement in the 1980s. 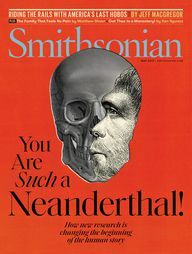 Andrew Curry’s article on Hadrian’s Wall appeared in the October 2009 Smithsonian. 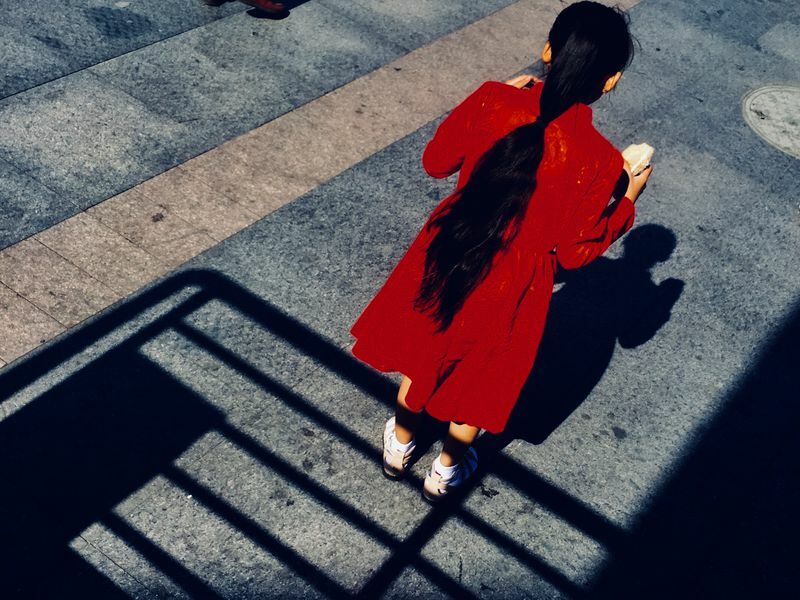 Maciek Nabrdalik is an award-winning photographer who resides in Warsaw.